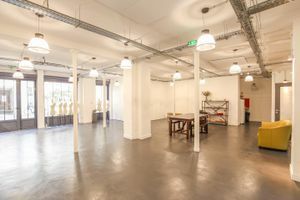 This light and spacious 172 sq m space is located in the Voltaire district, close to Charonne. It is versatile and ideal for a number of potential events, showrooms and private sales. It is available to book furnished or empty. The space is comprised of three rooms. 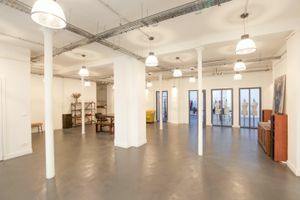 The main room of 105 sq m is open plan with large windows, white walls, a polished concrete floor and industrial style lighting, with wooden and metal accents throughout. 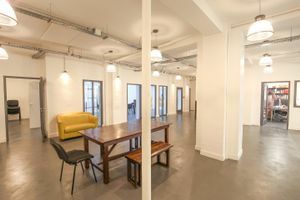 The second room of 45 sq m is modern with dark flooring and immaculate white walls. It also features a large skylight which allows natural light to flood the space. Facilities include a 22 sq m stock room, sound and video equipment, a kitchen and an extensive selection of furniture and display options. 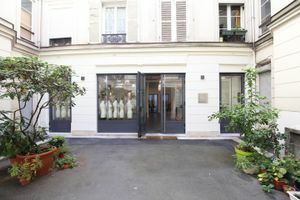 The sleek entrance is in a light and well-kept courtyard. This space is highly adaptable, allowing you to maximize your creativity and tailor your event experience to your customers' wants and needs.